Harold (Harry) Jones was born in Sealand on 17th February, 1893 and was the fourth child of seven children to Evan Jones and Elizabeth Vaughan (Jones). His younger brother Edgar Vaughan was a printer who traded from a building behind the Royal Oak, Flint, then his son, Edgar Vaughan Jones Jr, took over the business and moved to the old Baptist Chapel at the top of Church Street, which is now a florists. Evan was born in Flint and Elizabeth in Liverpool. No record of their marriage could be found. The 1891 census found them living at Brook Street, Connah’s Quay where their first three children were born, and Evan was employed as a brewer’s carter. Then they moved to Sealand where their next three children were born, then by 1901 they had moved to 17, Mount Street, Flint, and now Evan was an ironworks labourer. By 1911 they had settled at 4, Mount Street. Harold was now aged 18 and was a shop assistant in Market Square. Elizabeth died in October, 1911, aged 52, and was buried in the Northop Road Cemetery. On 29th November, 1914 Harold married Sarah Helen (Ella) Roberts at St Mary’s Parish Church and set up home at 91, Chester Road. They conducted their own small general business in Oakenholt. It is not known if they had any children. He enlisted in Flint circa December 1915 and was posted to France. On 18th June, 1917 his battalion was fighting in the Monchy trenches, which were heavily shelled throughout the day, and Harold was killed in action along with five others. His death was reported in the County Herald on 29th June 1917. The information reached Flint on Tuesday and was specially conveyed to his father that Corporal Harold Jones, who with his wife had resided in Chester Road, Pentre, Flint, had been killed in action. Mrs Jones, who was away from home on Tuesday, had not received the customary letters from her husband during the latter end of last week, and the anxiety therefrom was sadly intensified by the communication from another source and one with whom her husband was acquainted at the Front. Corporal Jones, it may be related, had been connected with the work of the Church Lads’ Brigade in Flint, and was held in esteem by all who knew him. His father resided in Mount Street, Flint, and the sympathies of friends are extended to the Corporal’s relatives. 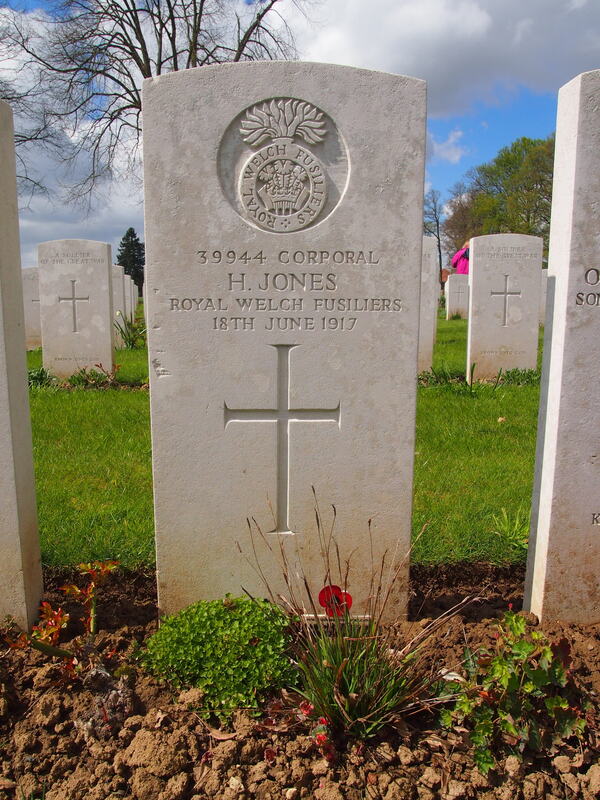 Corporal Jones was buried in Delville Wood Cemetery, Longueval, France, in Plot XIV, Row F, Grave 8. He is remembered on two war memorials – Flint Town and St David’s Parish Church, Oakenholt. Ella re-married in 1919 to John Carrington Evans, a wheelwright, of Derwen Villa, Flint and by 1938 they were living at 63, Chester Road, Flint, which is now the Ming Sing Chinese Takeaway. Evan died on 25th November, 1934, and was buried with his wife. Obituary: Mr. Jones had been in failing health for some time, and was confined to his bed for a fortnight. He was a native of Flint, being the son of the late Mr and Mrs Jones, Topyffordd, and was held in high esteem in the town, where the greater part of his life was spent. For over 30 years Mr Jones was employed at the Hawarden Bridge Ironworks. He was connected with Caersalem Welsh Presbyterian Church for many years, and was one of the most faithful members of the Sunday School.